Hi! I'm revamping the site! Most photos might not appear because of Photobucket *rolls eyes*. Might try to host them in another place but eh. Surprise surprise! A post in the afternoon hahaha, it's weird huh, nah i'm juz bored and dun wanna post in the night for today. I'm off to visit my aunt later who's giving birth today too heh, so i figured out why dun i juz post now since i so free. Anyways it's been along time since we had Gundam Seed Destiny ... so here's Ep21's screenshots! Ep20 is not here cos it's juz a recap, and i'm lazy to screenshoot them. 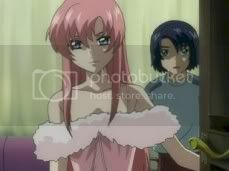 Ok, Ep21's roughly abt Luna-maria jealous over the fake Lacus, Mia Campbell's over-zealous stickyiness with Athrun. 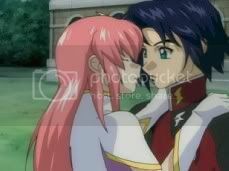 Haha, Athrun seems to make a poor attempt to cover up for himself. And so we finally sees the 'first' contact of Shinn and Stellar face to face. Even though they met each other a few times over battle but they never knew who they were fighting haha. Stellar was like hopping around a cliff feeling very happy, Shinn was there too, he was juz there feeling the breeze and stuff. Suddenly, Stellar fell down the cliff and into the sea, Shinn saw it and jumped in after her and saved her. They took refugee in a uh cave then Stellar went nutty crying that she's gonna die. Shinn calmed her down saying that he'll protect her. So she calmed down. Then they exchanged names and 'gifts' haha. 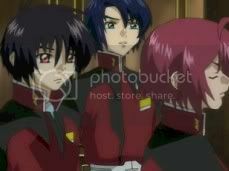 Shinn then broke his tracker thingy so tat Athrun will know he's in danger and come save him. Yeah. The ep ended with Stellar calling Shinn's name like forever [Rolls eyes] lol I was like juz shut up already. But, i like Stellar ahaha. So yeah. That's all. I'm gonna watch School Rumble Ep19 later yeah, i got 2.48GB left yay. I think i'm going over to Taka to visit my friend, lc who's selling perfume for mother's day. Ehh, but i dunno when le hahaha, i might buy one ... i dunno it's expensive le ... i never used perfumes cos i'm allegic to it. Hahaha, and i wanna buy mangas, hard drive and mp3 player! So i think i'm going to buy everything in a day hahaha. I'm a 'Buy-everything-today-and-i-dun-wana-go-out-anymore' kinda person. Yeah tat's abt all i guess. Oh yeah, here's a similar banner i made for akayuuki.blogspot.com haha, juz smaller and yeah. Yeah, check it out, it's a Stefanie Sun Yan Zi layout hahaha, i changed the template the blogspot.com thingy gave, it looks like my YanZi fansite hahahaa. I'm lazy to think of new layouts la, besides i think it looks ok to me. Well cya then! PS: Manz, the padding looks so freaking weird ... keh. to the hell with it la, Man this thing sure is laggy hahaha. Or is it my lappy? I dunno la who cares. Manz, i've been trying to post up this post for 30mins lol.